I received the refund of the credit card from a FX broker called FXDD via your company. 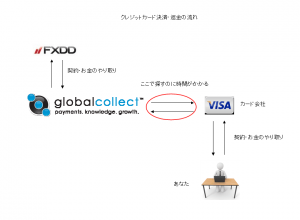 The report that 9/4 was repaid at the credit card end **** was received from FXDD. However, the way of the credit card company here is not yet reached. I would like you to teach about what time refund becomes. Thank you for contacting GlobalCollect. GlobalCollect is a Payment Service Provider. A Payment Service Provider handles payments on behalf of other companies. We’ve processed this refund on behalf of FXDD on August 30. We’ve received the confirmation from our bank that the refund is processed on September 4. A refund takes normally 4-5 business days to be processed. Your bank should be able to locate the refund based on the Acquirer Reference Number (ARN). Please be advised that our bank has provided us with the following Acquirer Reference Number (ARN) for the refund: ***********************. Please contact your bank / credit card issuer, and request them to start a search for the refund based on the above provided ARN. Copyright © 2014 FX自動売買最強投資術 All Rights Reserved.